The Easybeats to AC/DC: The Story of Aussie Rock – BBC4 | Bombora Film and Music Co.
A film about the sound of Australian rock and the emergence of one of the world’s greatest rock bands – AC/DC, or Acca Dacca as they are known in Australia, and the legendary music company, Albert Music (Alberts) that helped launched them on to the global rock scene. Through the 1960s, 70s and 80s, Alberts created a house of hits in Australia that literally changed the sound of Australian popular music. It started with the Easybeats and their international hit Friday On My Mind back in the 60s. In the 1970s when Australia was in the midst of a deep recession, a rough and ready pub rock sound emerged, characterised by bands like Rose Tattoo who were promoted by family-run company, Alberts. The raw power and fat guitar sound that characterised Aussie rock was pioneered by the Alberts and took Australia and the world by storm. The sound of Aussie rock really exploded when the Alberts, a well-to-do family from the Sydney suburbs, joined forces with the Youngs, a Glasgow family who had emigrated to Australia. The result was AC/DC. 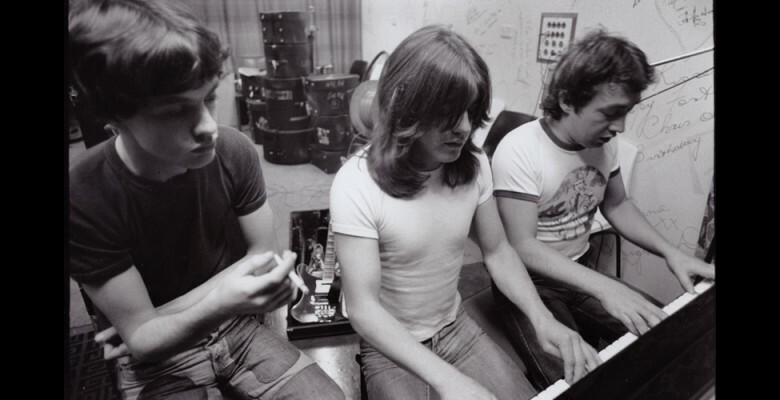 The documentary tells the story of how brothers Angus and Malcolm Young were produced by their older brother George and fellow Easybeats member Harry Vanda. Vanda and Young produced the band at Albert Studios and they were soon joined by the wild and charismatic lead singer Bon Scott. Head of Alberts was Ted Albert – a quietly confident risk taker. He backed AC/DC for many years with rock-solid conviction when their type of music and fashion seemed completely at odds with a UK and US music scene dominated by punk. Then, in 1980, AC/DC’s Back in Black album was a massive success around the world and the rest is history. The film retraces the band’s explosion in popularity, the relentless touring and the tragic death of Bon Scott. Even after Bon’s death, and with the addition of Brian Johnson, the band went from strength to strength and remain hugely popular and one of the world’s most legendary bands. Today, the Albert family remains a potent force in Australian music.